In a new aquarium, there are not enough of the bacteria to cope with the waste load and toxic Ammonia can rise to dangerous levels. 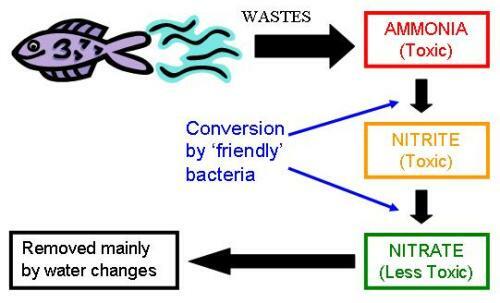 Eventually, enough bacteria build up to convert the Ammonia to another, only slightly less toxic compound - Nitrite. This too will then rise to high levels until a second type of bacteria increases and converts it to the much less toxic Nitrate. This process can take several weeks. In the confines of an aquarium, there is not really a complete “cycle”, and most of the end product, Nitrate, is usually removed by water changes. A mature tank should always have a zero Ammonia and Nitrite reading, with Nitrate as low as possible. After initial set-up and filling, leave the tank running with the heater and filter on for at least a few days before adding fish. This allows time for the temperature to stabilise, etc. There is little point in allowing the tank to run empty for much longer than this, as it cannot start to mature properly until the first fish (or an alternate ammonia source) are added. Add only a few hardy fish at first, and feed lightly to minimise wastes. Test water regularly and perform water changes to reduce the levels of ammonia and nitrite if they become dangerously high. Do not add more fish until ammonia and nitrite levels have returned to zero. If possible, obtain some gravel, tank decor, plants or filter media from a mature tank. This will introduce some of the necessary bacteria and may reduce or even eliminate cycling time. Biological filter boosting products are available which may help to reduce cycling time, but you should not expect them to remove the need for careful stocking and monitoring. Consider using an alternative source of ammonia (which is the main fish waste product) to cycle the tank, for example Waterlife BioMature. Pure household ammonia (with no additives) can also be used. This is known as “fishless cycling”. There are many sources of information about this process on the internet. Once the aquarium is mature, avoid damaging the essential bacteria which have built up by washing filter media such as sponges or other “biomedia” lightly in tank water only. Never wash any biomedia in chlorinated tap water or hot water - this will damage the bacterial population which has built up.